When I finished my holiday baking and treat making last year, I told myself that this year's list of treats should probably be a bit shorter. Well, that didn't work. Before I even started baking this year, I had a list of 17 different treats. To be honest, my goals were probably a bit overzealous. At one point, I was commenting to a friend about feeling behind on my baking. "I might only get four treats made," I told her, with sad acceptance. "Why don't you just make four treats and call it good?" she asked. I didn't have a good answer for my friend at the time. But after I thought about it for awhile and talked to my sister, I realized that deciding to just make four of the cookies on my list would require something terrible: choosing. As in, choosing which of the 17 cookies on my list were most important or most favorite. That, my friends, would be like asking me to pick my favorite child. It simply couldn't (and shouldn't) be done. 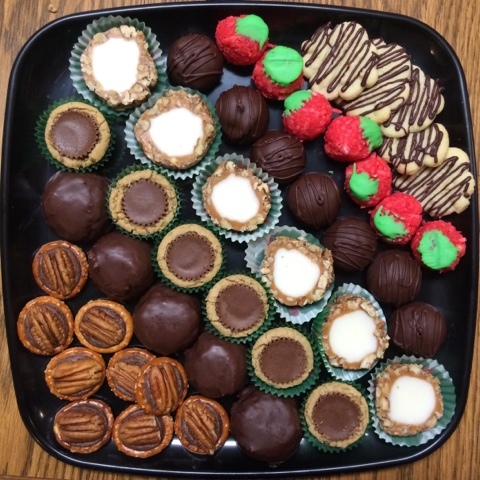 Part of not being able to choose is that I was again bringing treats to my family's Christmas gatherings and I know that certain family members have certain favorite treats. It didn't help either that I asked my family for their special requests and wanted to honor those requests. I developed this recipe last fall after discovering real buttercream frosting. This was another new recipe for me this year. I used this recipe from Land O'Lakes and coated some of the rolls with salted pecans, some with salted peanuts. (The 2 cups of chopped nuts called for by the recipe wasn't enough.) I will definitely be making these again next year, but I'll use all peanuts – those tasted better. More like a Salted Nut Roll. I'll also be rolling the filling into smaller diameter logs, so that the finished candies are smaller. These chocolate cookies from Bridget Edwards' book, Decorating Cookies, are as gorgeous as they are tasty. I tweaked the recipe a little for a couple reasons that I'll share in a future post. 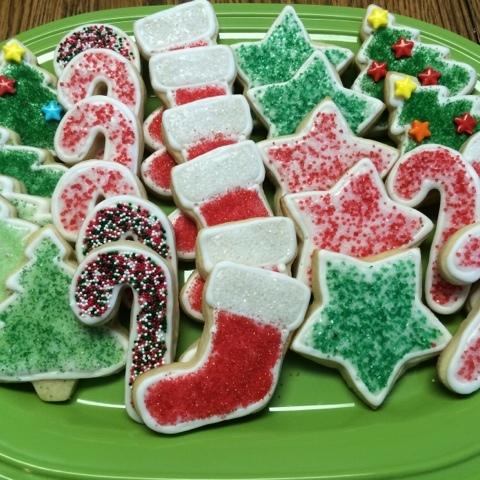 I made these and the Cream Cheese Sugar Cookies for the cookie decorating get-together we had with friends. I suppose I could have just scrambled all the egg whites I had left over from making the spritz, sugar cookies, and buttercream bonbons. Instead, I made coconut macaroons and dipped them in chocolate. I combined a couple different recipes with fantastic results; I'll share the details in a future post. These might be my most requested cookie. I make them with raspberry extract and then add raspberry extract to the icing, too. Raspberry + Cream Cheese = Scrumptious! I tried a new method for icing the cookies this year and am pleased as punch with the results. 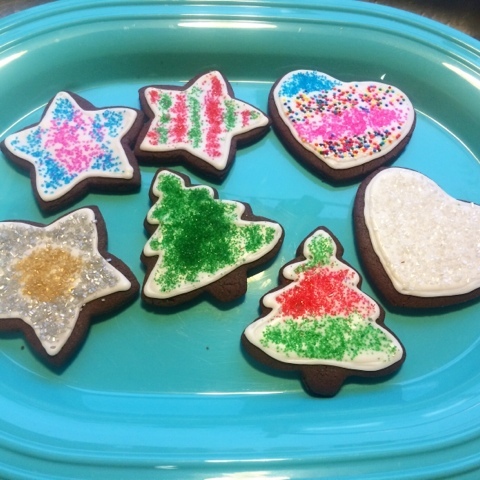 The kids and I made some mini cookies this year, too, and decorated them with just sprinkles. Yes, they're really called fat cookies. These no-chill cut-outs are rolled out thicker than a regular sugar cookie and puff a little when baked. I got the recipe from my friend Marcia a couple years ago, but this is the first time I've made them. I think I'll be making them more often because they're super quick and easy to make. And super yummy! Marcia's recipe says the cookies should be frosted with white butter frosting, but I wasn't sure which of the million butter and powdered sugar recipes out there to use. I found a recipe on the side of an extract bottle for white wedding frosting. I substituted salted butter for the shortening in the recipe and had the perfect frosting for these cookies. The kids said that Santa's favorite cookies are chocolate chip, so I made my go-to chocolate chip cookies for Santa's cookie plate. I made them about half the size I normally do (using a #40 scoop, instead of a #20, and baking for 11-12 minutes) so they'd fit better on a cookie tray, but they still ended up having a tray all to themselves. A recipe for Chewy Oatmeal Decorating Cookies came up one day when I was searching the King Arthur Flour website and I was immediately intrigued. Even though the reviews following the recipe were mixed, I gave it a try. The resulting cookies were awful – Ozzy (our dog) wouldn't even eat them. I thought this recipe had potential, though, and I love a good culinary challenge, so I tweaked the recipe and made them again. Then I tweaked the recipe a few more times and ended up with a cookie so tasty that my sister-in-law said they might almost be better than my chocolate chip cookies. I need to make these one more time so I know for sure the recipe is a winner and then I'll share it. I have been making these for years – they're basically Buckeyes that I dip completely in chocolate. But, every year, I fiddle with the recipe or the technique for one reason or another. This year's version was as close to perfection as I've got yet. Last year I tried making these fruity candies with shredded, unsweetened coconut and had trouble forming them. This year, I had some sweetened, flaked coconut to use up, so I went back to that. The flaked coconut, which is what my grandmother used, works much better. I also ran out of white chocolate for making the leaf on top, so I used green icing. I'll go back to tinted white chocolate next year. I probably wouldn't make these if I didn't have kids who love unwrapping candies! Last year, I made these with a flourless peanut butter cookie dough. This year, I tried using the peanut butter and oatmeal dough (sans chocolate chips) from Kathy's Cookies. The oatmeal-peanut butter dough didn't work quite as well, so I'll go back to the flourless peanut butter cookie dough next year. Plus, then my gluten-free friends can enjoy these tasty treats. Oh, and I also used muffin tin liners this year, which was a huge time saver in removing the cookies from the muffin tins. More candies for the kids to unwrap! 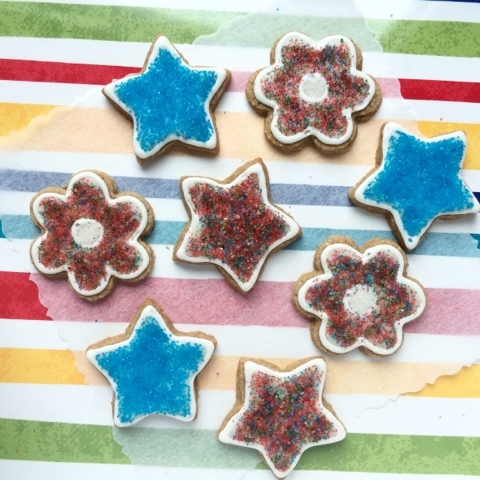 Glen loves these treats and, minus the candy unwrapping, they are so quick to make. This year, I found round holiday pretzels at the grocery store in October (yes, October!!) and bought several bags. Last year, the round pretzels were all sold out by the time I was ready to start my holiday baking. I made these for the first time last year, using the recipe from my parents' recipe box. But when we got to my dad's for Christmas, I found a different recipe with my grandma's notes on it inside the box that holds her old cookie press. I tried that recipe last spring. The cookies turned out even better than the ones I made last year. I made them again for Christmas, but I think I was a little short on the flour this time, because they spread more than I wanted them to. They still tasted great, though. At Glen's request, I also tried drizzling some of the spritz with chocolate this year; it was a nice addition to the traditional almond spritz flavor. 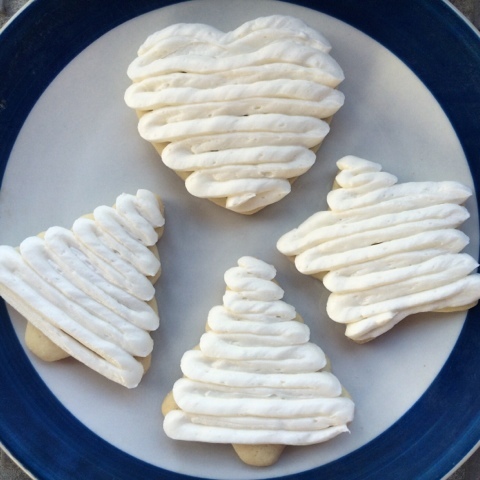 What Christmas cookies did you make this year? What are your favorite holiday treats? Could you pick just one favorite, if you had to?